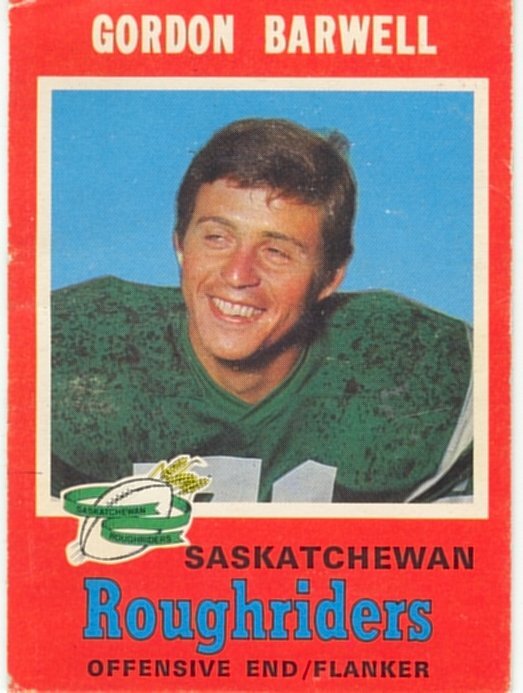 Barwell joined the Riders from the Saskatoon Hilltops Jr. team in 1964 and played 10 years in the CFL, all with the Riders. In his rookie season, Barwell played in just 6 games and had only one catch, but played in every regular season game for the next 9 seasons. Barwell saw his time on offense increase in the years that followed, along with his offensive production. In the five years, starting with his rookie season, Barwell's cat ches went from 1 to 8 to 27 to 30 and to a carerer high of 40 in 1968. While he never led the league in receiving, Barwell was a steady receiver from the Riders and a part of the 1966 Grey Cup championship team, the first in Rider history.